At Pauley’s Pups, we love to learn about small dog breeds and how they came to be. As Lhasa Apso owners already know, their dogs like to be aware of their surroundings. Always protective of their companions and healthily wary of strangers, the Lhasa Apso is a small dog that doesn’t let its size get in the way of its propensity for guarding the home turf. Living as long as 20-plus years, these dogs never let go of their lookout post, treating new company with suspicion while displaying an incredible sense of loyalty towards their housemates. So how did the Lhasa Apso become such an unlikely, yet effective watchdog? The truth is they were bred that way. The Lhasa Apso is one of the oldest dog breeds in the world, believed to have originated thousands of years ago as a relative of the mountain wolf in Malaysia. Tibetans began to breed the dog to guard the homes of the nobility, referring to it as “Apso Seng Kyi”, which translates roughly to “bearded lion dog”. Rather than actively protect the homes and Buddhist monasteries of Tibet, the Lhasa Apso used its incredible hearing and unmistakable bark to sound the alarm of intruders. The Lhasa Apso played a role in the Buddhist belief in reincarnation, as their bodies were sometimes believed to be inhabited by the souls of deceased Buddhist spiritual leaders called lamas. Perhaps this is why they were trusted to keep such a good watch over the monasteries. Selling a Lhasa Apso to an outsider in mid-life would have been highly frowned upon in ancient Tibet. In 1933, the Lhasa Apso breed was introduced to the United States when the Dalai Lama presented two of them as a generous gift. The seemingly exotic name they were given is actually quite simple when translated. Lhasa is the capital of Tibet, while Apso is the Tibetan word for “bearded”. 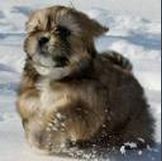 Today, countless Americans enjoy the Lhasa Apso as a strikingly beautiful, friendly and playful small breed family dog. The fact that their appeal can be traced back to such grand spiritual origins makes them even more interesting. Carry on the Tibetan tradition by welcoming a Lhasa Apso puppy from Pauley’s Pups into your home.